Most visitors to Hawaii arrive by air and Honolulu is home to a modern and busy airport, full of all the usual services and airport facilities. Hawaii has become an important Pacific hub and Honolulu is also a useful stopover on flights that travel between mainland American and Asia, Australia, New Zealand and the South Pacific. 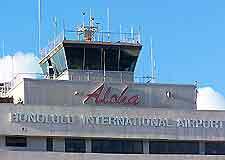 Most international and domestic flights traveling to Hawaii arrive at Honolulu International Airport (HNL). 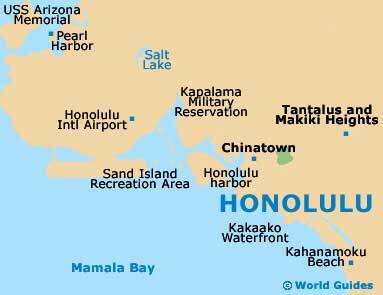 Honolulu Airport (HNL) is situated just 6 km / 4 miles from the city center, serving a number of large airlines, including Air Canada, Air New Zealand, American Airlines, Canadian Airlines, China Airlines, Delta Airlines, Hawaiian Airlines, Qantas Airlines, TWA and United Airlines. Honolulu Airport contains three separate terminals, serving a large number of airlines. The airport's terminal buildings are connected by frequent WikiWiki shuttle buses. The center of Honolulu is easy to reach from Honolulu International Airport (HNL) by car and the route is well signposted. Located close to the H-1 Highway, the journey from Honolulu International Airport (HNL) into the city center lasts approximately 10 minutes. A number of different public bus services can be found at Honolulu International Airport (HNL), including buses traveling to the Waikiki area, downtown Honolulu and nearby shopping centers. Shuttle buses are also available at Honolulu Airport, providing travel directly from the airport many central Waikiki hotels. Taxis remain one of the most popular methods of transportation at Honolulu Airport (HNL) and are operated by Signature Cab Holdings. The main taxi rank is situated outside of the airport's baggage reclaim area and the taxi journey from the airport into central Honolulu is extremely quick, lasting around 10 minutes, depending on traffic levels. Taxis often apply additional changes for extra luggage, passengers, and travel on public holidays, although the overall charge is relatively inexpensive. It is therefore sensible to agree all charges first, before departing from Honolulu International Airport (HNL).